The Players’ Championship is this week. It’s time to play my favorite game – that’s right, the guessing game! Raise your hand if you chose Tiger Woods or Phil Mickleson. Yeah, too many. I’ve said it before and I’m going to say it again, I wouldn’t bet against Tiger – the odds are pretty good. And, Phil’s been playing pretty well recently. However, I believe you gotta take some risks in life. Geoff Ogilvy: He’s won twice this year. Sure, he didn’t finish well last week. Sure, he hasn’t finished well at Sawgrass in the past. But, he’s an excellent ball striker – well, maybe not so much lately. Either way, Ogilvy is a Player. He’s due for another solid showing, and it’s just a matter of time ‘til he secures his third win in ‘09. Sergio Garcia: He won last year and he was runner-up the year before. He’s a winner, that one. I don’t care. I’m not a fan. In other news, you can dress Sergio for Round 2!!! 50 bucks that if he misses the cut, he’ll blame the voters. 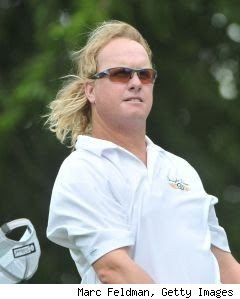 Charley Hoffman: Who? Yeah, that’s what I said. But, when I was browsing through the field, I came across his name and looked him up. Hmmm. Wowzers, he’s been playing solid all year. Where have I been?! Hoffman has made the cut in each of his 10 appearances this season. He’s placed second at the FBR Open and in the top-25 nine times. He might not be a “bold-faced” name, but it’s golf; anything can happen. I also really like his hair. John Mallinger: I know this is a long shot, but I’m going with it. Like any great championship, the Players has produced some unlikely winners over the past few years. Mallinger hasn’t had the greatest season – his best finish this year was T-6 at Bay Hill. His only other appearance at Sawgrass was in ‘07 when he finished T-64. But, hey, you could say he’s ready for a breakout performance. Cool fact: His roommate pro golfer, Travis Mathew, started an awesome clothing line that Mallinger sports on Tour. None of the above are actually my first pick. Shane Bacon (FanHouse & Dogs That Chase Cars) started a new feature for the major tourneys, “The Blogger’s Players Picks.” (Love it.) So, who’s my fave to win? Check it out HERE.